This has been a crazy week in our house. I had planned to post about my "Baklawa" before Easter. This is a staple on our dessert table every year. I did get it made but, never got to post. This past week I had my three grandchildren here. My 7 year old granddaughter and her 3 year old twin brothers. They were a joy but, kept me veeery busy! There was no time for the computer during the day and I was way too tired after they went to bed. We had decided to spend one of the days visiting the Crayola factory. It is about an hour away from us in Easton, Pa. An enjoyable day we thought!! 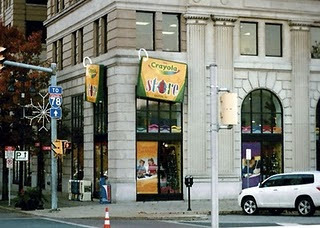 We had been there before and it is a really fun place for the kids to run around and enjoy all the wonderful things Crayola makes. There are dozens of hands on activities for the kids to experience. 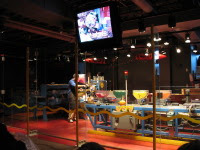 They also have a demonstration on how crayons are made. This is not a real manufacturing plant. 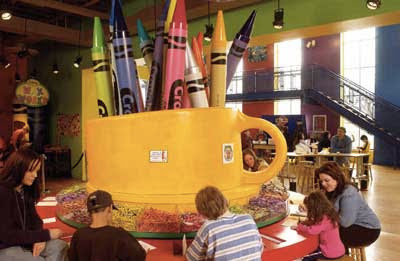 It's a colorful center that allows children of all ages to unleash their creativity! However, the Crayola Factory was not such a fun place during spring break! Wall to wall parents with way too many kids, made for a very challenging day! Nevertheless, my grandchildren did enjoy all the fun and creative things they could do there. They loved the "Chalk Walk" and they really enjoyed the demonstration of how the crayons are made. Dancing in the "Cool Moves" exhibit was so great. You can create art, by moving your body. This psychedelic color kaleidoscope follows every move. After a full day of wonderful activities, grandma and grandpa were tired!! 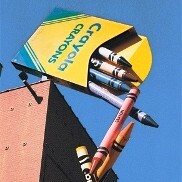 No visit to the Crayola Factory is complete without a visit to the store!! One of the many art stations. My grandchildren dancing in cool moves! On Thursday, I had my husband take the kids to the park, so I could get the Baklawa made. They were thrilled when they saw an eagle that's nesting at a nearby lake. Grandma was thrilled to get some baking done for Easter. My Baklawa is not a Greek version…it is Lebanese or Middle Eastern. The Syrup is probably the biggest difference. A simple syrup made of sugar and water with orange blossom water, lemon juice, and cinnamon. Mix sugar and water, bring to a boil. Boil for about 10 minutes on low. Let cool slightly and add lemon juice and orange blossom water. When I make this syrup I slice thin slices of oranges and lemons and put them in the pot with the water and sugar, along with 2 cinnamon sticks. Pan: I used a round 13 inch pan…You may use a jelly roll pan, mine measures 10 1/2 x 15 1/2. cuts at 1 1/2 inch intervals. Then starting at one corner, make cuts, on the diagonal at 1 1/2 inch intervals to form a diamond shape. Cut through the top layer only. Bake 60 minutes, or until golden and puffy. Turn off oven and leave in oven for another hour. Remove from oven and pour cooled syrup over hot baklawa. Following the diamond pattern cut all the way through baklawa. The syrup should always be cool and the baklawa hot when you pour the syrup. Syrup can be made a few days ahead of time and kept refrigerated until ready to use. Syrup...water, sugar, orange and lemon slices and cinnamon sticks. After it cools add orange blossom water and lemon juice. Filo pastry…keep it covered so it doesn't dry out. Beautifully golden…just out of the oven! I came, I saw, I ate.....it was delicious as always.....another winner Kathy....you make me feel like a dunce with your beautiful food and your excellent kitchen skills, we so appreicated all the lovely food but especially your baklava! These look better than the Greek ones near my office! Then again, some of those are laden with honey, so I think I'd prefer your Middle Eastern version any day! Great post! How gorgeous, Kathy! Truly one of my favorite desserts, but I've never tried to make it - the springform pan is a great idea - maybe I'll finally try it! It would have been fun to meet you while I was in NYC! Susan, It would have been so nice to meet you, too!! Funny how this blog has brought so many of us together, sharing a special interest. The pan I used is not a spring form…it is a 13 inch round pan that I picked up a few years ago in a middle eastern grocery. I think it is made just for baklawa. Lizzy, Years ago my grandmother always made hers in a round pan…much bigger then the one I used. When I first started to make mine I used a jelly roll pan. It works very well..then I saw this pan and had to have it!! We put cinnamon in just about everything! I'm glad you had a great time with your grandchildren. Your baklawa looks fantastic! I have only had the Greek version. Yours has so much filling...Mmmm.. Love your plate! beautiful baklawah! i love seeing all the variations of this very traditional lebanese dessert!